p 10 Call To Register 253-841-5457 Youth Sports Youth Baseball/Softball Registration for the youth baseball/softball program will be conducted from Monday, February 4 through Sunday, February 24 on a space available basis. 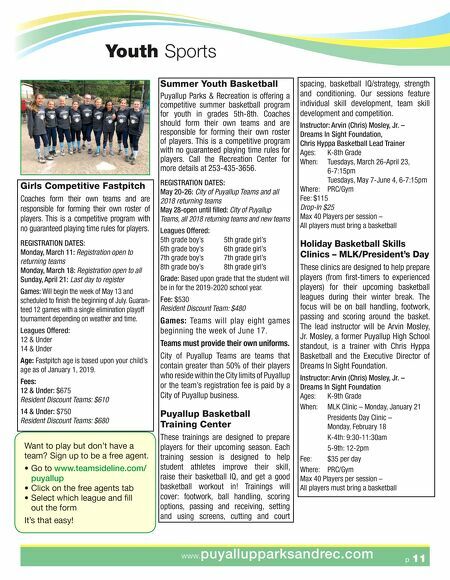 Leagues will be offered for boys & girls 5-14 years of age. All players listed on last year's team roster must submit a current registration. Uniforms and equipment will be provided. Cost for the program will range from $58-$93 depending on league. Registration Dates & Prioritization: Please note that registration will be limited due to limited field space. Participation on a team last year does not guarantee a spot on this year's team. You must register dur- ing the dates listed. All registrations will be accepted on a space available basis. REGISTRATION DATES: February 4-10: City of Puyallup Residents Only (Incorporated City Limits) February 11-24: City of Puyallup Residents, all 2018 returning players and new non- resident players Leagues Offered: (Individual registration only, no team registration) BOY'S T-BALL Res Non-Res Ages 5-6 $58 $70 12 games BOY'S COACH PITCH Res Non-Res Ages 7-8 $58 $70 12 games MINOR LEAGUE BASEBALL Res Non-Res Ages 9-10 $78 $93 14 games MAJOR LEAGUE BASEBALL Res Non-Res Ages 11-12 $78 $93 14 games JUNIOR BASEBALL Res Non-Res Ages 13-14 $78 $93 12 games GIRL'S T-BALL Res Non-Res Ages 5-6 $58 $70 12 games GIRL'S COACH PITCH Res Non-Res Ages 7-8 $58 $70 12 games GIRL'S FASTPITCH Res Non-Res Ages 9-10 $78 $93 14 games GIRL'S FASTPITCH Res Non-Res Ages 11-12 $78 $93 14 games Special Requests: There will be no special requests for youths participating in the Minor, Major or Jr. Rec. League Baseball Program. There will be no special request for girls participating in the Girl's 12U Fastpitch Program. These teams will be formed through a draft system. Baseball: Age is based upon your child's age as of April 30, 2019. Softball: Age is based upon your child's age as of January 1, 2019. Bring the registration form, fees, and a birth certificate to the Puyallup Recreation Center, 808 Valley Avenue NW. Practices: Practices will begin the week of March 18. Games: Games will begin the week of April 22. Uniforms & equipment will be provided. There will be a $5 administrative fee for all refunds issued. 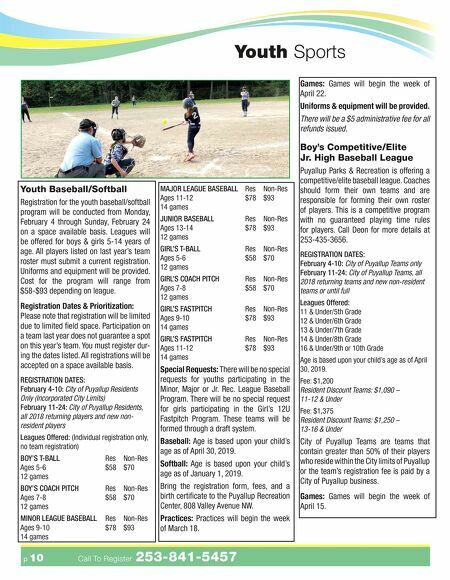 Boy's Competitive/Elite Jr. High Baseball League Puyallup Parks & Recreation is offering a competitive/elite baseball league. Coaches should form their own teams and are responsible for forming their own roster of players. This is a competitive program with no guaranteed playing time rules for players. Call Deon for more details at 253-435-3656. REGISTRATION DATES: February 4-10: City of Puyallup Teams only February 11-24: City of Puyallup Teams, all 2018 returning teams and new non-resident teams or until full Leagues Offered: 11 & Under/5th Grade 12 & Under/6th Grade 13 & Under/7th Grade 14 & Under/8th Grade 16 & Under/9th or 10th Grade Age is based upon your child's age as of April 30, 2019. Fee: $1,200 Resident Discount Teams: $1,090 – 11-12 & Under Fee: $1,375 Resident Discount Teams: $1,250 – 13-16 & Under City of Puyallup Teams are teams that contain greater than 50% of their players who reside within the City limits of Puyallup or the team's registration fee is paid by a City of Puyallup business. Games: Games will begin the week of April 15.